Lineage: Bikshuni Pema Chödrön is a leading exponent of teachings on meditation and how they apply to everyday life. She is widely known for her charming and down-to-earth interpretation of Tibetan Buddhism for Western audiences. Pema studied under the meditation master Chögyam Trungpa Rinpoche and currently studies under Sakyong Mipham Rinpoche and Dzigar Kongtrul Rinpoche. She is the resident teacher at Gampo Abbey, Cape Breton, Nova Scotia, the first Tibetan monastery for Westerners. Biography: Ani Pema Chödrön was born Deirdre Blomfield-Brown in 1936, in New York City. She attended Miss Porter's School in Connecticut and graduated from the University of California at Berkeley. She taught as an elementary school teacher for many years in both New Mexico and California. Pema has two children and three grandchildren. While in her mid-thirties, Ani Pema traveled to the French Alps and encountered Lama Chime Rinpoche, with whom she studied for several years. 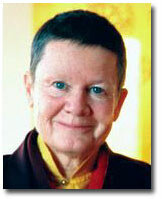 She became a novice nun in 1974 while studying with Lama Chime in London. His Holiness the Sixteenth Karmapa came to England at that time, and Ane Pema received her ordination from him. Pema first met her root guru, Chögyam Trungpa Rinpoche, in 1972. Lama Chime encouraged her to work with Rinpoche, and it was with him that she ultimately made her most profound connection, studying with him from 1974 until his death in 1987. At the request of the Sixteenth Karmapa, she received the full bikshuni ordination in the Chinese lineage of Buddhism in 1981 in Hong Kong. Ani Pema served as the director of Karma Dzong in Boulder until moving in 1984 to rural Cape Breton, Nova Scotia to be the director of Gampo Abbey. Chögyam Trungpa Rinpoche gave her explicit instructions on establishing this monastery for western monks and nuns. Ani Pema currently teaches in the United States and Canada and plans for an increased amount of time in solitary retreat under the guidance of Venerable Dzigar Kongtrul Rinpoche. Ani Pema is interested in helping establish Tibetan Buddhist monastacism in the West, as well in continuing her work with western Buddhists of all traditions, sharing ideas and teachings. A monastery of the Kagyü lineage of Tibetan Buddhism. Founded by Chögyam Trungpa Rinpoche in 1984, it is an affiliate of the Vajradhatu Buddhist Church of Canada and Shambhala International. The Venerable Khenchen Thrangu Rinpoche, previously Abbot of Rumtek Monastery in Sikkim, is the abbot. All are available from Shambhala Publications. She is currently working on a commentary on Shantideva's Bodhisattva's Way of Life that will be published by Shambhala Publications in 2005.